Maple Leafs Mailbag: Possible Interest in Duchene? As one of the more storied franchises in the National Hockey League, there are often questions, comments and (always) opinions floating around social media regarding the Toronto Maple Leafs. These questions or concerns often lead to much bigger conversations and that’s where we come in at The Hockey Writers. We’re looking to bring the discussion to your computer screen – inserting our thoughts on the questions and concerns raised by our readers. With that said, you can get your questions in for our weekly mailbag by sending your thoughts to @AndrewGForbes on Twitter or email them to andrew@thehockeywriters.com. A step up from last week, we received a couple of notes from hockey fans and Leafs fans this week discussing the upcoming trade deadline and a song named after the team’s newest star. That being said, here’s what came in the mail this week. Dubas and Co. were in Colorado last Thursday, so I’m starting the rumour mill because I don’t want to work. There’s a lot of talk about what the Leafs apparently need heading into the deadline. Some say they need a top-four defenceman (I tend to be on this boat), while others argue that the Leafs are in need of another skilled forward down the middle. If that’s what they need, Matt Duchene would certainly plug that hole. Giving up Tyler Bozak, Jake Gardiner and a first-round pick, though? That might not be the best idea. Duchene was drafted third overall in 2009 by Colorado. Since then, the 26-year-old has 172 goals and 413 points in 550 regular season games. However, with the lack of success in Denver lately, he’s seen just eight NHL playoff games in which he’s recorded six assists. Bozak was signed as a collegiate free agent by the Leafs. At the age of 30, Bozak has 306 points (121g-185a) in 492 regular season games and is on the verge of a career year this season. Like Duchene, he hasn’t seen enough playoff action to debate his worth in the postseason. Gardiner has had up-and-down success in Toronto in his young career. Taken 17th overall in 2008, he has 152 points (37g-115a) in 386 regular season games – all with Toronto. He is just 26 years old and has a lot of hockey ahead of him. Like Bozak he’s already set a career-high in points this season. On top of that, it’s suggested the Leafs give up their first-round pick in 2017? Here’s the thing. Bozak is a conservative $4.2-million cap hit. But his contract is over after the 2017-18 season. Gardiner is a $4.05-million cap hit and his contract runs through the 2018-19 season. 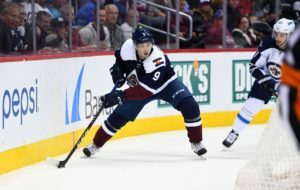 From the Colorado standpoint, Duchene’s contract is a respectable $6-million cap hit through the end of the 2018-19 season, according to Cap Friendly. That isn’t a bad contract for the Leafs to take on. But that does open another hole on the Leafs blue line – a spot they already need to fill. On top of that, the Leafs aren’t exactly in a spot right now to win it all. If they were, I’d say go for it. Make the big trade. Grab that big name to put you over the edge. But, simply put, they aren’t there yet. Delving a little deeper, Gardiner is second on the Leafs with a 53.2 Corsi For Percentage (CF%), while Bozak is seventh on the team at 52.3 percent (according to stats.hockeyanalysis.com). Duchene’s CF% is just 48.7 this season and over the last two years he’s sitting at 46.6 CF%. That’s all comes in 5-on-5 situations. That being said, an offensively minded centre isn’t exactly what the Leafs need right now. Actually, they could use more of a two-way middle man with more offensive upside. So my initial reaction would be to shut down this trade suggestion and simply trust the process that the Leafs and Brendan Shanahan currently have in place. In fact, it would completely shock me to see the Leafs make any kind of big splash at the deadline. Minor pieces might fly out of Toronto, but don’t expect movement of this kind for the Maple Leafs this season. No, this isn’t a question. No, it’s not a comment on where the Leafs are at right now in their rebuild. Instead, it’s a statement – an artistic one at that – declaring that the Leafs now have one of the best young stars in the game. Black Irish, along with Xuave and SVDVM, recently released the music video for their song entitled Auston Matthews. As Ottawa-based artists, the song references what the hockey world bore witness to in Matthews first game against the Ottawa Senators – a four-goal game. But don’t let me just sit here and tell you about it. Take a listen for yourself (WARNING: This song contains strong language which is not safe for the workplace). I assure you that the beat will get stuck in your head if you listen to it enough. If I’m not convincing enough, just ask Matthews who gets to hear it on the way to the rink. Auston Matthews on the rap song about him: Mitch always plays it on the way to the rink. The song can be listened to on a number of platforms – including YouTube, SoundCloud and Spotify – and is available for download on iTunes. We’ll be opening more Maple Leafs mail next week, so be sure to get your questions, comments or anything else related to the Toronto franchise into me on Twitter at @AndrewGForbes or via email.